Good Golly Ginger: Hello Spring! This week I have been busy making these flying geese, 160 of them, 1-inch by 2-inches. They are for a mini quilt which is in celebration for the March Mini Madness at the Fat Quarter Shop. 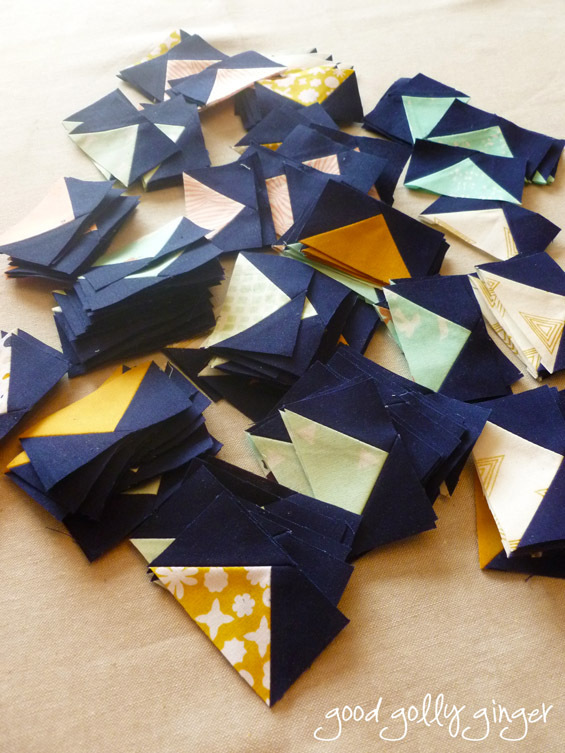 Now that I made the flying geese, the quilt assembly should go pretty quickly. This sale goes on through midnight tonight. The Fat Quarter Shop is challenging everyone to create and share their mini quilt projects with us ALL March long starting MARCH 9th – MARCH 31st on Facebook, Twitter, and Instagram using #marchminis. There is a small giveaway too...Technically, this giveaway is not small at all, but it’s just filled with their favorite small and mini things including patterns, notions, and precuts. oh boy those are so small they can't be geese, they must be goslings, which really are way cuter than geese. Seriously 1x2 holy smokes!!! Love your gypsy cog wheel block and that the accuquilt dies that go with it.